The ongoing commentary about the condition of a western whiskey bottle that was offered at auction recently - awakened thoughts about how western collectors grade the condition of bottles and how picky they have become. The auction houses all grade their offerings on different platforms. Western collectors usually grade bottles by the three “C’s”. Color, condition and crudity. Then there are the folks that grade bottles as if they were coins. Phrases like “absolutely mint” “bold strike” and “PERFECT” are thrown about like loaded dice. Let’s start right off with defining “mint”. Mint condition is an expression used in the description of pre-owned goods. Originally, the phrase comes from the way collectors describe the condition of coins. Mint is the place where the coin was manufactured. Mint condition is the condition a coin is in as it leaves the mint. Over time, the term "mint" began to be used to describe many different items (including bottles) having excellent, like-new quality. For a bottle to be mint it must be in the same condition as when it left the factory. Agreed? If you agree with the term mint condition then stress cracks, annealing checks and other in making flaws are acceptable distractions to a bottle, it came from the factory that way didn’t it? . Are you still with me on this or are you collecting “perfect” bottles? Perfection is a philosophical concept and not necessarily a condition of a piece of glass. If you want a “perfect” bottle then just maybe you will need to improve on what the factory manufactured. There are lots of people in the bottle community that can take your bottle from mint to perfect and most all of them charge for it. Cleaning, polishing, removing chips, gluing on tops…you get the drift. As a collector matures and becomes more sophisticated he starts to appreciate the character of a collectible piece. Whether it is the unique handmade appearance, apparent in-making flaws or just an honest wear pattern, the not so perfect has become perfect in his or her eyes. If you’re using a 30 power loop looking for flaws in western glass you certainly are going to find them. Early western glass is full of in-making flaws. Potstones, cooling checks, stress cracks and a host of other imperfections plague early western glass. If you are looking for western whiskies without issues my advice is to start collecting turn of the century tool tops. There are plenty of rare and desirable “perfect” western tool top whiskies to put on your shelf. Can I offer you whiskey or gin? Yes please!! I think we should start a club of Jockey Club collectors ... you can jump in with both feet this month, just a nominal investment with Jeff at ABA. Seriously, what beautiful bottles. There have been several posts about both the Chesley Jockey Club whiskey bottles and the Jockey Clubhouse Gins on this blog and the Western Bitters blog. Currently a great post on the Peachridge Glass website. Click on the link to see the rest of the story. My old pal, TQ, once again came through with some amazing "stuff" and what he provided is nothing short of the smoking gun in the Thistledew mystery. Here is where things really start to gel. Look at the broadside in the window. It advertises none other than, Thistledew Whiskey. 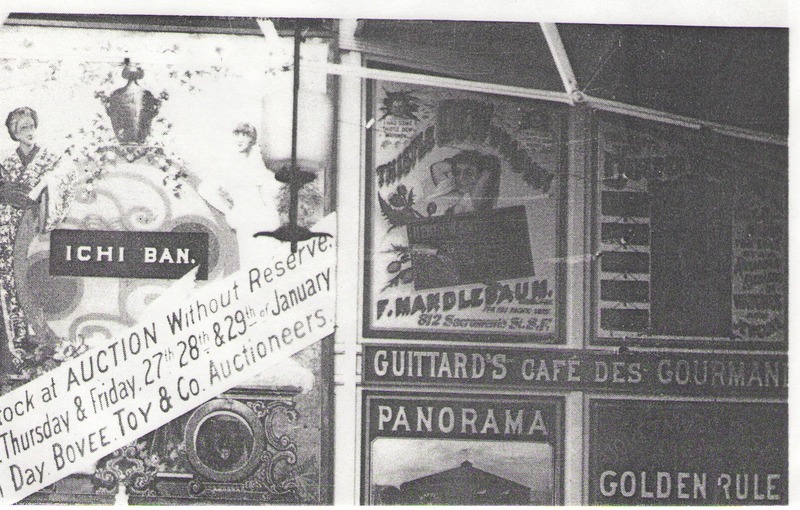 And, it clearly shows F. Mandlebaum as the Sole Agent for the Pacific Coast. An invoice dated 1879 from Mandlebaum clears up two decades old questions. The address on the invoice matches that on the broadside; 312 Sacramento. But this invoice is for Nabob Whiskey! 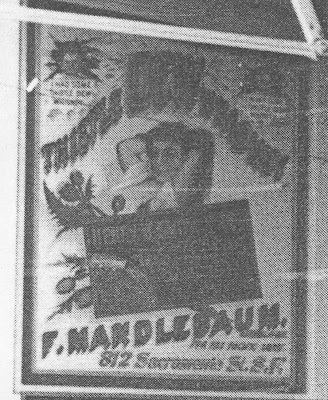 And so, Mandlebaum was responsible for both Thistledown and Nabob. But, check out the fine print on the invoice~ We always assumed that the product, like most whiskies was available by bottle or in bulk in the form of hogsheads. Notice though, the reference to flasks? Ones mind whirls with visions of grandeur when the possibility of a picture flask exists. Look out N. Grange and J. Moore! Sometimes truth is stranger than fiction. If you recall in the first write-up, I mentioned the movie Deadwood, as being one of my all time favorites. Little did I know that Deadwood would figure prominently into the Thistledew / Nabob saga. 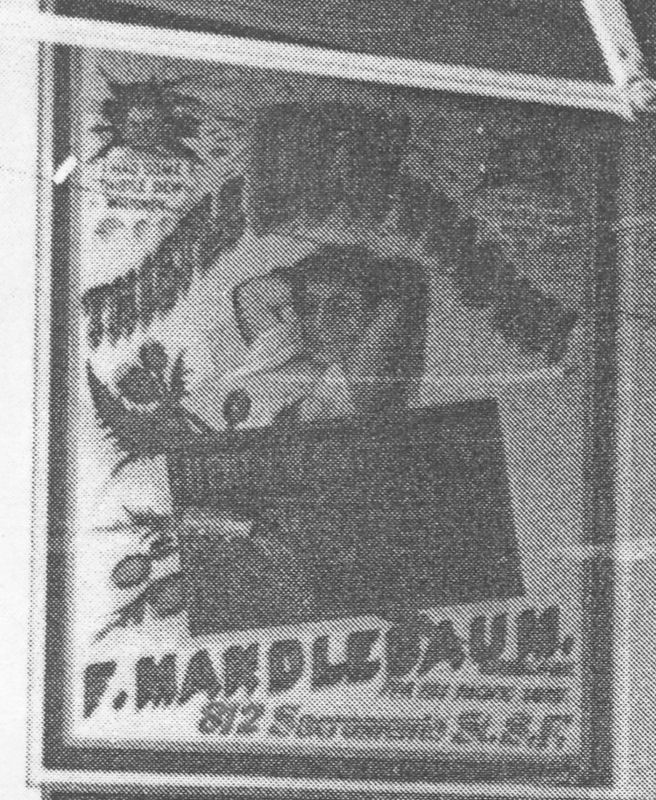 By 1886, Manflebaum disappears from the picture and Geo. Simmonds is handling the Nabob product himself out of his place over at 215 - 217 California St., less than two blocks away. Note the invoice mailed to... you guessed - Tombstone! 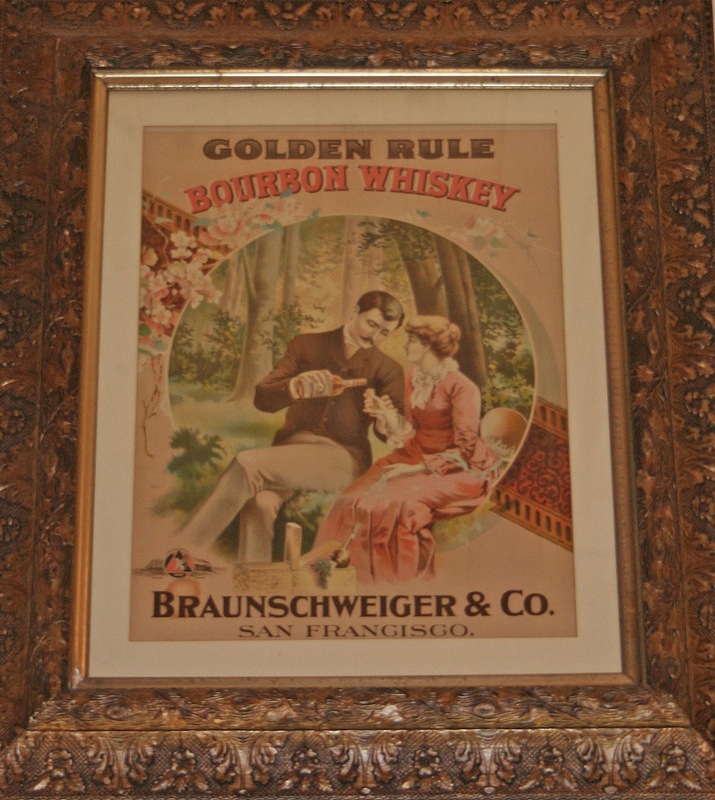 Although Wyatts residency in Tombstone was from 1879 - 1881, he or brothers Virgil and Morgan may well have imbibed of Nabob at one time or another while dealing faro in the Oriental Saloon. To sum it up, Thistledew had two Sole Agents handling the brand consecutively. F. Mandlebaum had the sole agency for the Pacific Coast in 1879, pushing the product hard, along with Simmonds Nabob. 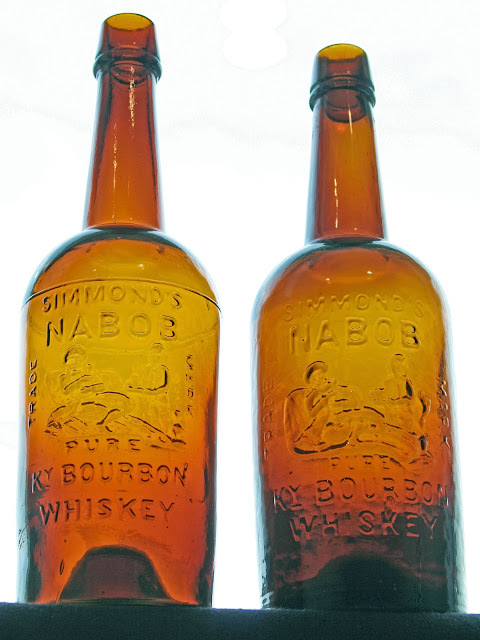 But by 1886, Geo Simmonds was handling the Nabob product on it's own. Thistledew had gained popularity in the silver camps of Nevada by 1887 and was being hyped by a W.O.H. Martin out of Reno. After that point in time, Martin disappears and the Thistledew saga comes to a close.